Now it's more EXTREME than ever! In Star Wars: EXTREME, Luke Skywalker completely loses his mind! He slices everything in half and Darth Vader catches fire repeatedly! I guess you all cannot handle this level of extreme. Star Wars + drugs? Star Wars + drugs. Because that's what you get when you combine Star Wars and drugs. It doesn't matter if the glass is half empty or half full. There's clearly enough room for more wine. 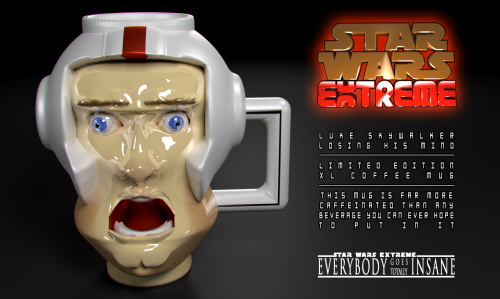 I think that mug reflects Luke's face if he HADN'T made it away from the Death Star in time when it exploded.